The world’s most advanced solar powered street bench is on its way to the UK, fuelled by growth in smart city technologies. 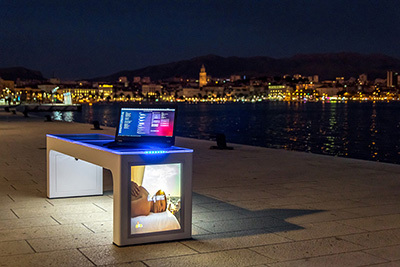 The Croatian-designed Steora Smart Bench has been installed in 125 cities and municipalities across the globe since 2015. High-end furniture supplier, All Urban Ltd, is now bringing Steora to the British market. All Urban plans to build on rapidly expanding opportunities for public wi-fi hotspots, and rising demand for renewable energy in urban spaces. “Steora comes with cable and wireless charging for all smart devices, CCTV, wi-fi and attractive ambient evening lighting,” said All Urban Ltd Managing Director, Paul Collings. “It also has a super bright LCD display that offers outdoor advertising opportunities for organisations like Local Authorities or retailers,” he said. It is the sleek design of Steora that has made it a success on the smartest streets of Europe and Australia, earning young Croatian creator Ivan Mrvos a place on the Top 50 EU Start-Ups list. Mrvos’s journey has been described as *one of the best entrepreneurial real-life stories in Croatia. In the three years since its conception, more than 450 Steora benches have been installed in 23 countries. As well as providing a social meeting place, Steora collects data on usage, climate and environment. The CCTV options are beneficial to areas requiring increased public surveillance. The bench provides tourists and local citizens with a social meeting place, while offering urban planners huge amounts of data to optimise public places and make them more efficient. Data collected by the bench is linked to a processing dashboard – making it the most technologically advanced bench currently on the market. The arrival of Steora also comes as Local Authorities are invited to apply for a share of EUR 120m of EU funding to support the installation of state-of-the-art wi-fi equipment in the centres of community life. It has an advanced web platform which Steora owners can use to track data from every bench in real time.